Enliven your presentations with crisp visuals using this DLP pico pocket projector, which weighs just 10.9 oz. For easy portability and features 854 x 480 resolution for clear images. Two 1W speakers provide high-quality sound. Specification: -Name: Cocopico N1 DLP Smart Pocket Projector -Product Size(inch): 4.37 x 4.4 x 0.74 -Product Weight(Oz): 10.9. Adopt unique technology to achieve high fidelity image and a clear bright and vivid picture. 1pc x Mini LED Projector. Super MINI. Composed of high precision and high light transmittance coating lens. Used but in excellent condition, working lamp. Details of projector are below 0.30" DLP (1). Projector Size Native Aspect Ratio Lens Focus Lens Shift Lamp Life. Display Technology: 0.2" FWVGA DLP. 360° Speaker: Equipped with a powerful omnidirectional speaker to pump out sound in every direction. Working Modes: Projector Mode, Bluetooth Speaker Mode. Speaker: 5W. ● Cutting-edge DLP technology for a clear, bright and vivid picture. Has a Powerful resolution and can show video content in 1080p. it yields Amazing color accuracy and produces beautiful, bright pictures. 1 USED Brookstone Pocket Projector DLP (864129). Only what can be seen in the pictures is what's included. ~~~~~~~~~~~~~~~~~~~~~~~~~~~~~~~~~~~~~~~~~~~~~~~~~~~~~~~~~~~~~~~~~~~~~~~~~~~~~~~. look at all pic. 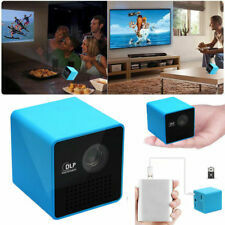 Features: 1.Model:P1 2.Name:Mini Projector 3.Small portable size,easy to carry and use 4.High brightness,high resolution,low power consumption 5.Good quality LED source,Stable and reliable performance 6.Support TF card and USB play video,music,picture,TXT,etc(TF card is not included) 7.Micro projector can be widely used in many fields,such as conference,mini lecture,watching movies and other home entertainment. Take your projector away from the outlets and directly to your visual sharing space. In addition, the one built-in 0.8-watt speakers will ensure you have sound wherever you are, and with the 3.5mm audio jack you can plug in your favorite external speakers for bigger sound. NM4 supports 3.5mm audio output and can be connected to an external speaker. Ideal projection distance is 1m-2.2m. This projector does not support Bluetooth. It's not HD but supports HD. To connect to iPhone, a lightning cable is needed (excluded). Lightweight and Pocketsize, easy to carry it everywhere. Adopt DLP Technology which use advanced Multi-Color processing, producing exceptional contrast ratios. Light Engine: USA TX DLP Technology RGB LED. Adopt unique technology to achieve high fidelity image and a clear bright and vivid picture. - Equipped with Micro SD Card Slot which supports up to 64G. - Composed of high precision and high light transmittance coating lens. 5,Vivid color display,OSRAM LED light source with DLP optical engine to bring gorgeous color performance. Imaging technology: DLP. 1 P1 DLP Projector. Resolution: 640 360 (1080p max). 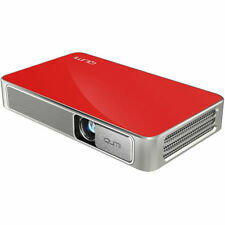 1,Mini size,one real micro projector,easy to carry. Native Resolution WVGA 1280x720(Support 4K /1080p）. Supported Resolution 1920×1080, 4K x 2K @3 0Hz. Product Type Portable DLP Smart Theater Projector. Output /Input HDMI 1.4 1、USBx2、EarJack 1、DC 19 V 1.89 A、wifi、 Bluetooth. ). Specifications: Display Type: DLP Brightness: 100 ANSI Lumens Lamp: OSRAM LED Lamps Uniformity: >90% FOFO Contrast Ratio: 2000:1 Standard Resolution: WVGA 854*480 Throw Ratio: 1.4：1 Throw Range: 30-120 inches Throw Distance: 1-3 Meter(s) Aspect Ratio: 4：3/16：9/16：10 Keystone Correction: Manual t-type correction Projection Methods: Front Projection back projection hang projection Operating System: Android 4.4.4 Customize Video Support: "Real-Time Video Decoder for MPEG-1 MPEG-2 MPEG-4, H263,H264,H265,VC-1,RV 1080P VP8,Sorenson SparkWAV" Audio Support: MP3,WMA,MP2,0GG,AAC,M4A,MA4,FLAC,APE,3GP,WAV Photo Support: Supports variety of image formats browsing jpg png bmp etc FLASH Support: Supports flash 11.1 Extended Memory TF card and SSD Hard Dish USB: USB HOST 2.0 TF Card Maximum supported: 32. Model: P1 . Adopt unique technology to achieve high fidelity image and a clear bright and vivid picture. Support: 1080P. 1pc x Mini LED Projector. Composed of high precision and high light transmittance coating lens. Features: Compact design, lightweight and portable, easy to carry. Apply unique technology to achieve high fidelity image and a clear bright and vivid picture. Quiet design, efficient cooling system. Handhold size make it portable for outside use! Type: LCD Projector. A suitable child projector——YG300! Support aspect ratio between both 16:9 and 4:3. and also great toy projector for kids play and education. Adopt unique technology to achieve high fidelity image and a clear bright and vivid picture. Projection Dist:0.3-4m. - Composed of high precision and high light transmittance coating lens. Lamp:RGB LED. S6 ultra-mini projector with the pico size at 5.5cm(L) x 5.5cm(W) x 5.5(H)(2.17” x 2.17” x 2.17”). And there are 2 ways for wifi connection: 1. 7" 8GB Android4.4 Quad Core 3G 2 Cam WIFI Tablet PC TF 64GB For Kid Bundle Case. It will bring you munch convenient and unexpected experience. 2 in 1 Multifunction: Android 4.4.2 DLP LED Projector Smart TV Box (Freely Switch). Physical Resolution: WVGA 854 480; Maximum Resolution up to 1920 1080 (HD 1080P Supported). (Video Formats: 4K VP9 / 4K 10bits / 1080P AVI（H.264, DIVX, DIVX, XVID, rm, rmvb, WMV, MOV, MP4（H.264, MPEG, DIVX, XVID), DAT（VCD), VOB（DVD), MPEG, MPG, FLV（H.263，H.264), ASF, TS, TP, 3GP, MPG etc. - Display type: DLP. Display Technology: DLP. The portable projector adopts advanced DLP 0.3 DMD technology with vibrant color technology to make a clear and bright projection. Vivid Clear Projection. Just connect the projector to your iOS/Android devices with the proper USB date cable. The possibilities are endless with this micro pocket projector. This projector has Built-in battery and Speakers. Miroir Micro Projector M20 Element Series DLP HDMI Portable Pocket NIB. Condition is New. Shipped with USPS Parcel Select Ground. 854 x 480 WVGA resolution. DLP (Digital Light Processing) technology. Weighs 9 oz. and includes a soft case for easy transport. Compatible with select Apple® iPhone® models. Along with an included micro-HDMI-to-HDMI adapter, mini-HDMI-to-HDMI adapter, micro USB-to-micro MHL cable and HDMI-to-HDMI cable allow flexible connectivity. And light weight at 0.173kg(0.38lb), yet its projection size upto 100”. And there are 2 ways for wifi connection: 1. S6 ultra-mini projector with the pico size at 5.5cm(L) x 5.5cm(W) x 5.5(H)(2.17” x 2.17” x 2.17”). S6 ultra-mini projector with the pico size at 5.5cm(L) x 5.5cm(W) x 5.5(H)(2.17” x 2.17” x 2.17”). Compact Pico Pocket Size With 100” Display. And there are 2 ways for wifi connection: 1. To connect IOS iphone wirelessly: Turn on S6 and choose wifi connection on the interface > Wifi connection. This item only opened to ensure proper working order and contents! ChiTronic HDP200 Texas Instruments DLP Pocket Projector. Shipped with USPS Priority Mail. 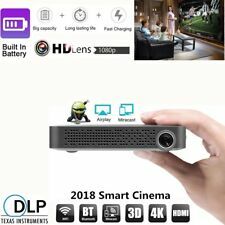 New item in OPENED box Mini Pocket Android IOS DLP Projector WiFi 3D HD 1080P Home Cinema Bluetooth USB. XFUNY LED Projector, Give You A Better Visual Experience! DLP Imaging Using Texas Instruments DLP micro-projection technology, the picture is clear and bright, exquisite and vivid colors. Hi-Fi Speaker Built-in high-fidelity speakers, providing clear sound, give you a better listening experience. Efficient Cooling The combination of fan aluminum radiator eddy current duct cooling engine, to ensure stable work 24 hours a day. Wireless Display: Airplay, Miracast. (Few projectors can do that). Built-in battery makes it to be used freely without having to search for electric plug. ♥Built-in Microsystem, wireless display capability support Airplay/Mira-cast with IOS Device or Android Smartphone. 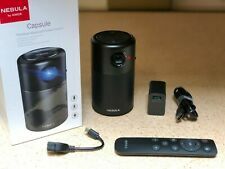 M6N DLP Mini Pocket HD Smart Projector：. Resolution: Native 854 480,supports 1080P. Wifi: 2.4G/5G Wifi. System: Android 5.1. 1 HDMI: MINI HDMI IN. Bluetooth: BT 4.0. Project Offset: 100%. Project Distance 18cm-300cm.